A quality made leather folding wallet, hand stitched for durability, and available in various quality leather options and colors. Built and ready to go. Typically ships within 2 business days. Slim profile wallet packs a lot and they work great as a front pocket and back pocket wallet. This fantastic 3/4oz soft Italian vegetable tanned leather is one of our favorites around the workshop. Beautiful in both the grain side and the flesh side, the finish is smooth to the touch and guaranteed to bring a wonderful patina. Soft and fairly supple for being a natural veg tan. A waxy pullup leather with a firm hand very similar to Buck Brown W&C harness. Tanned in the state of Maine. Expect firm waxy temper that gains a beautiful soft break in. Beautifully finished traditional harness from the American Wickett & Craig tannery in Pennsylvania. The flesh side is also finished for a nice feel and color. 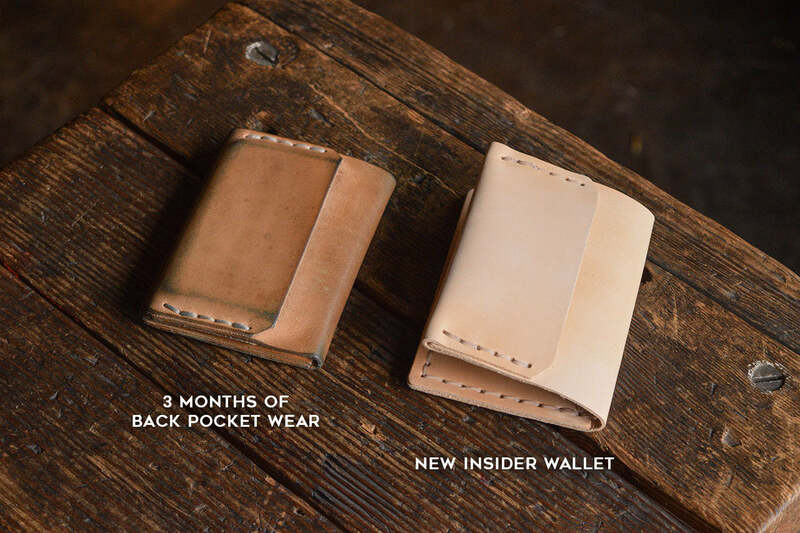 Expect a waxy and slightly firmer hand if you prefer your wallets a bit more rigid in structure. Beautifully finished traditional skirting leather from the American Wickett & Craig tannery in Pennsylvania. The flesh side is also finished for a nice feel and color. Expect a semi-firm hand, a dry feel the same as natural veg tan. Choose from a couple of our favorite Horween leather options in both Dublin and Chromexcel. Horween leather is tanned in Chicago, a world famous tannery, known for it's high quality luxury leather that needs very little break-in and is a complete joy to handle. The rare and highly coveted Horween Shell Cordovan option can be available for those who are willing to wait for the best of the best. The most commonly available colors are Burgundy (Color #8) and Black. Wait times could be 4-6 weeks and even longer if you're interested in Natural or Cognac (Dark brown). Just leave a note on checkout with your color preference and when the time comes we'll be in touch about the details of what you'd like. If they are marked as sold out and you'd still like to be added on the wait list, please contact us and we'll get you set up. Thank you.